Transporting your boat to and from the Minnesota waters looks easy, assuming you have a functioning boat trailer. The minute your boat trailer needs repairs, spending time on the nearby lakes becomes a thing of the past. You simply don’t realize how important a trailer is until it’s not working. So, when your boat trailer goes bad, it is important that you have a reliable repair team on your side that can tackle your boat trailer repairs quickly. By choosing to work with our staff at Anchor Marine Repair, we’ll have your boat trailer back to working order in no time! At Anchor Marine Repair, we take pride in being able to address any repair you need on your boat, jet ski, or boat trailer. There is no reason why you should have to go to multiple boat repair shops for various needs. Thanks to our 10,000 square foot facility, we can address your trailer repairs fast. With over 45 years of combined experience, you can rest assured that whatever repair you are dealing with, our team has seen it before. If you are running the damage through an insurance company, our team at Anchor Marine Repair will be happy to assist. Lastly, if you are having trouble getting your damaged trailer to our shop, we offer complimentary pick up and delivery services to and from our St. Paul/Minneapolis repair shop. By combining expert repair services and high quality customer service, we have earned the ultimate accomplishment of being the #1 boat repair shop in the Minneapolis area! ● Rust and Corrosion – Any time metal comes into direct contact with water, there is a risk for rust and corrosion damage. Pulling your boat in and out of the water can cause your boat trailer to weaken over time. Anchor Marine Repair can help get your trailer back to 100%. ● Electrical – Have the brake lights on your trailer stopped working? Drop your trailer off at our shop and we’ll get your brake lights working in no time. ● Bodywork Damage – Don’t be embarrassed if you have bodywork damage on your trailer. 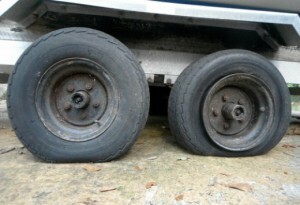 Accidents happen, and our team can get your trailer repaired quickly and efficiently. So, if your boat trailer needs repairs, there is no better partner in Minnesota than Anchor Marine Repair to fix the damages. Give us a call today at (763) 972-3540, or email service@anchormarinerepair.com to request a free estimate.